We, Julien Martin and ELLO, would like to give back some of the LOVE the ELLO community has given us in the last years! 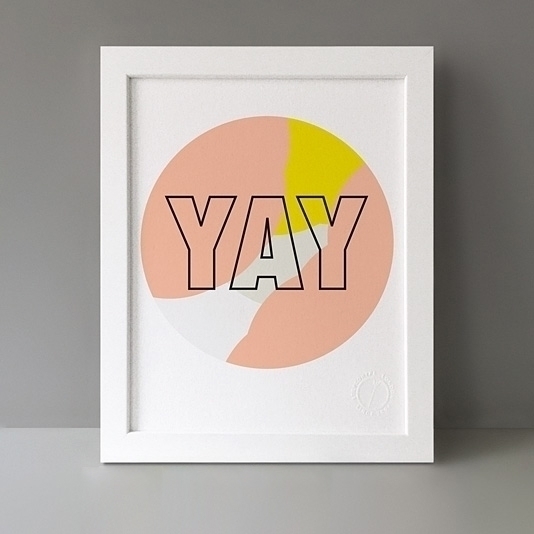 Please leave a comment to this post and WIN a Fine Art Giclée "YAY" Print. They are printed on super-elegant Hahnemühle German Etching Textured 310gsm. This is one of Hahnemühle's genuine artist papers, mould made, 100% acid free paper with an exceptionally smooth surface. This velvety heavyweight etching board has a fine surface texture. German Etching is one of the most popular media for artwork and photography. The paper is made of 100% cotton or pure alpha cellulose presenting a textured surface that allows high quality printing. Artworks are printed with archival inks – a ten colour ink set including orange and greens for vivid and long-lasting results. Size: 8" x 10" / 203mm x 254mm, certified at the bottom right with Stereohype embossed print series seal. Unframed.